First up... 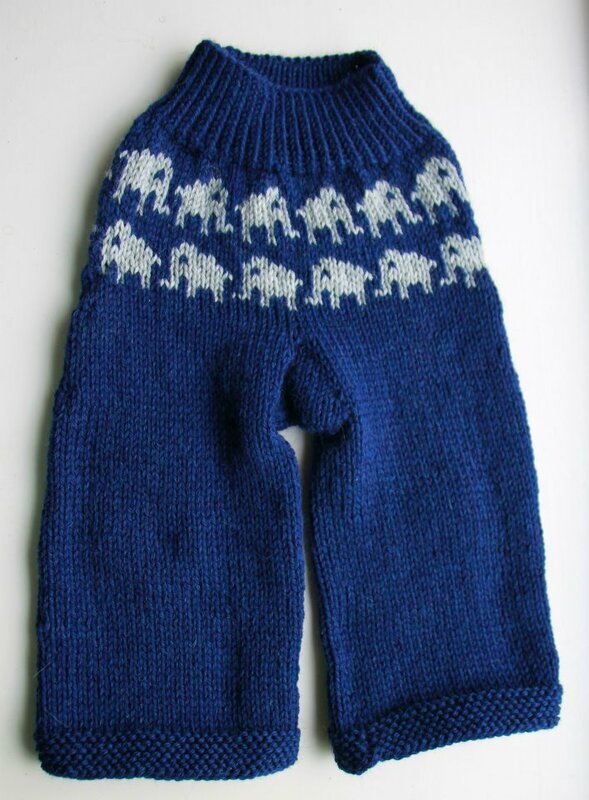 Marching Elephants longies! The pattern is my own and the elephant chart can be found HERE. These were a custom knit for a super duper adorable baby boy. When I get modeled photos, I shall share! Knit using Cascade 220 in navy and light gray. 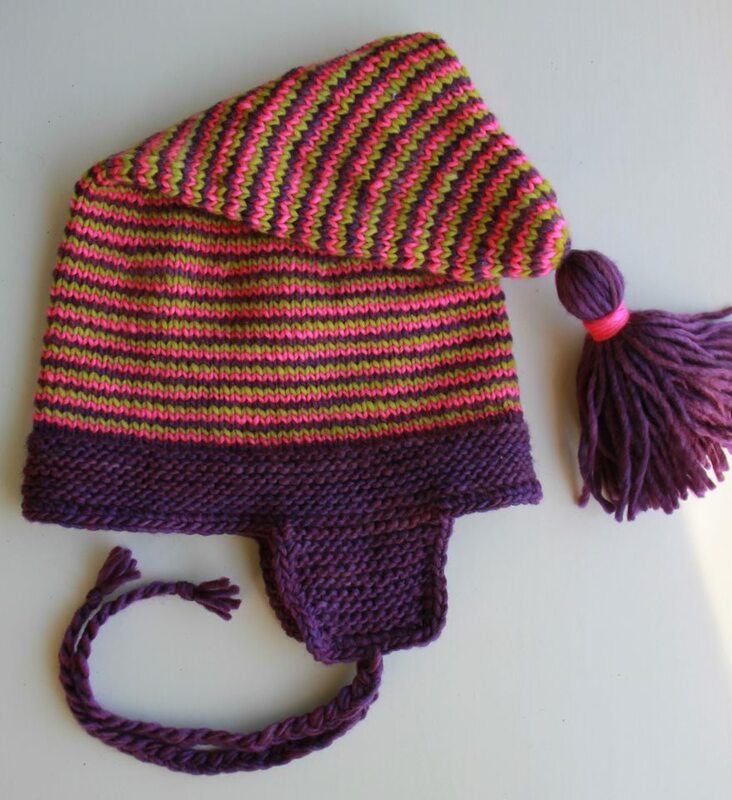 Up next is a stripy hat (another custom knit for a super duper adorable toddler girl!) and the pattern is again, my own. Mmmmmmmm. Malabrigo is the yarn I chose. The hat is roughly a 24mo size. Baby K needed a Yoda hat for his Halloween costume. I whipped this up in about a day. The pattern can be found HERE. I decided not to do the ear flaps and cord b/c I um, ran out of time! I did however use glue to make the ears stay up more. Used Berroco Ultra Alpaca yarn for this project. Made for soft felted wool! While I cannot promise I am back to blogging full time, I can promise that I am actually knitting over here. I have also been playing with interlock wool. This weekend I plan on dyeing a bunch of it. I'll keep you updated. If you haven't had a chance, go on over and "like" my FB page. I seem to be on there a little more frequently. I also have some giveaways planned so stay tuned! ps - They have $1 shipping EVERY.SINGLE.DAY. Baby K is five months old now. I know, how did this happen? Just yesterday I was complaining about how hugely pregnant I was and now here we are, 5 months later. I love this age. He is so sweet and cuddly. Smiles all of the time and has the sweetest giggle ever. 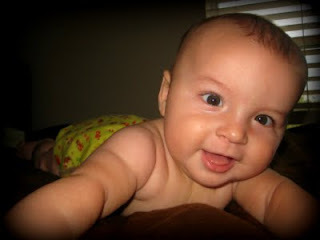 Baby K is rolling all over the place (need to baby proof the house asap! ), putting everything in his mouth and loving his big brother. It's so awesome to watch the two interact. The Little Dude loves to make his baby brother laugh by dancing and singing. Baby K is like my little koala cub. Attached at the hip, hanging on for the ride. If I am in the room, he is on me and I love this. Having been down this road, I know how short this time is. Daycare drop off is really hard some days, but knowing I get to see him on my lunch break makes it a little easier. Happy Five Months Baby K!! The Little Dude completed a super impressive lego (castle!) project that is (according to the box) meant for ages 6-12. He's 4. I know he is my kid, but I really think he is super smart. The kid can focus. My cloth diaper obsession reached a new level. I dreamed that one of my favorite brands (Sustainablebabyish) came out with a new color of knits. WOW. I have 3+ custom knitting orders going on right now. I really LOVE to make things for other people. It's why I knit. Once winter (does that really happen here?) arrives you will see me complain about how I have no handmade knits for myself to wear. I am already excited for the Holidays. Funny how I get SO excited months in advance to set up decorations, yet as soon as Christmas is over I cannot get the decorations put away fast enough. I am often confused by the "competition" for sales amongst crafters. People buy what they want to buy. There is no need to try and one up or "steal" sales. Let's all play nice! On the edge of my seat to see if I get accepted to a Masters program for the fall. They JUST started checking applications. Um, registration started this past Saturday. Something seems off about this. It's a UT system school and I am not sure what the delay is all about. I am camera-less. Had to return my lens because the auto-focus stopped working. Lesson learned: Do not buy a camera lens from South Korea off of eBay. Knitting tip! When making a top-down cardigan, use smaller needles (by at least TWO sizes) for the first couple of rows so that the neck isn't all wonky and easy to stretch out. 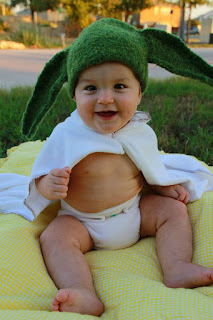 I leave you with an adorable fluff photo of Baby K.
Did you know that Be Knit Picky is now accepting custom orders? See something you like in the shop, but it's not the right color/size? Send me an email and we can create a custom listing! Coming soon are hand knit, 100% wool soakers, shorties and longies for your little one. There will be plenty in stock for insta-fluff gratification (I can even lanolize for you! ), as well as custom orders. Have a specific color or design in mind, email me and we can make it happen. Most knitters have lots of projects in progress. I refer to this as Knitting ADD. It's highly possible I suffer from this. Working on just one project is boring in my opinion. I often find too that while I am working on one project, I am thinking about another. In a sense, I am cheating on my projects. Bad, bad knitter! Be Knit Picky, the shop (hehe, sounds funny when it's written that way) is currently focusing on tees, which are awesome, but I need more hand knits. Over the next couple of weeks, I am going to be focusing on hand knits. What sort of hand knits would you like to see in stock at Be Knit Picky the shop? Be Knit Picky on FaceBook! When I get to '50' likes there shall be a knit-tacular giveaway... One that's for all people, not just the cloth diaper or yarn lovin' peeps. It's gender neutral too. An accessory that is useful to all. Click on the button and go check it out..
© 2011 All original images and text on this website are copyright and the property of Brenna Kotar. Powered by Blogger.